Intentional or not, Upper Deck has released cards that aren’t all too serious. 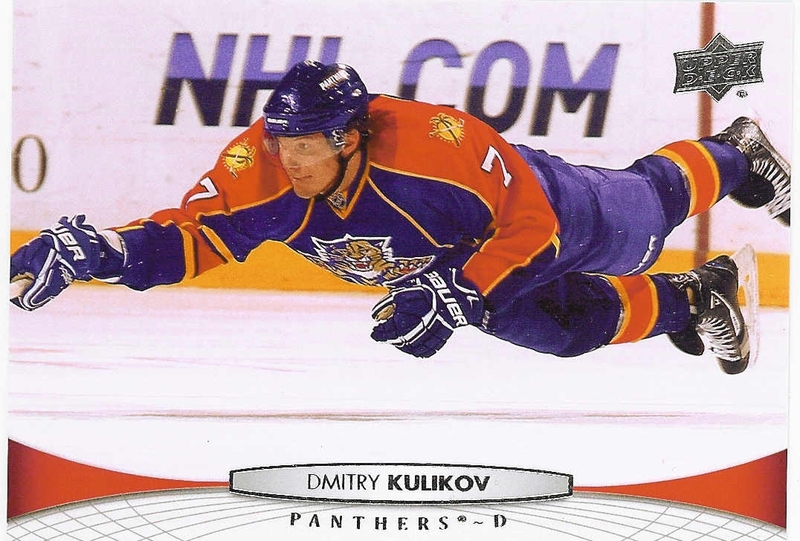 They provide comic relief from the action shots that glorify each player. Below is a list of humorous cards released by Upper Deck. Feel free to post your own top comedic cards in the comments section. I think you have to be ashamed of this one as a fan. 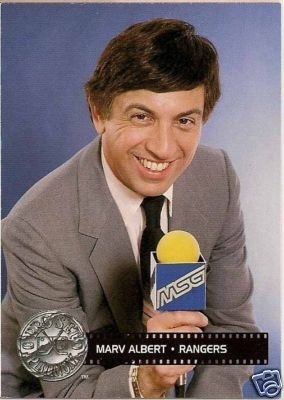 Considering it’s an announcer/analyst, it’s not that bad until you take a gander at the smile. A smile that stretches into a cartoonish grin really stands out. But what really makes it is the gigantic nose. I mean, that’s at least three times as big as my nose. Overall, he looks like a guy who could be featured as a guest star in a comedy show. The eyebrows and smile give Marv a cartoonish feature. Nothing says defense like flying through the air. As we can see, it’s not the smartest position for blocking shots, and is probably the least helpful thing he could do. He obviously wasn’t tripped. You just don’t fall down like that. All we can assume is that his childhood hero was Clark Kent. 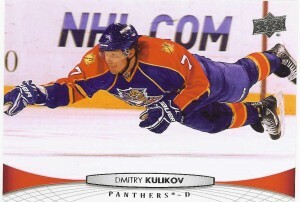 Dmitry, I like you as an offensive player, not as a defensive player after seeing this play. All he’s missing is a cape to make the Superman pose complete. I wonder what his Kryptonite is? 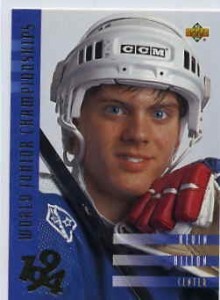 Well, this is by far the creepiest hockey card I have ever seen. The hand gesture really adds to the grinding teeth. Poor Christian seems as if he’s about to cry. So many terrible things you could say about this picture, but I’ll try to stick to the positives. – There’s probably going to be a penalty on the play. – At least the player holding on is ending the play. – Upper Deck gave me a much-needed laugh! No offense to Canucks fans, but it’s just a funny reaction by both brothers. The awe in their faces is just fantastic. It looks like his brother in the background has got a whiff of something unpleasant. I’m sure this card makes their mother very proud. Leave you own captions for this picture in the comments section. What is Henrik Sedin staring at? 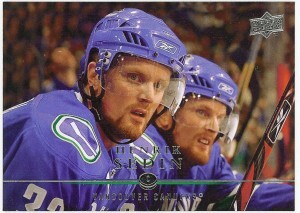 What is brother Daniel Sedin smelling? Upper Deck, my apologies but this one is on you. I remember when I once pulled this out of a common bin and my dad and I could not stop laughing for about an hour. It is by far the funniest card I have ever seen. It seems like Kevin was a bit too eager to get his photo taken. The fact that the CCM helmet is two sizes too big also adds to the potential. And what’s not to like about the eyes that could possibly burn a hole in my skin? Bryzgalov’s mothership will hopefully land sometime soon, but they might need to make one more stop. He looks like Adam Banks from the Mighty Ducks movies. Thank you for the read! I appreciate your comments! 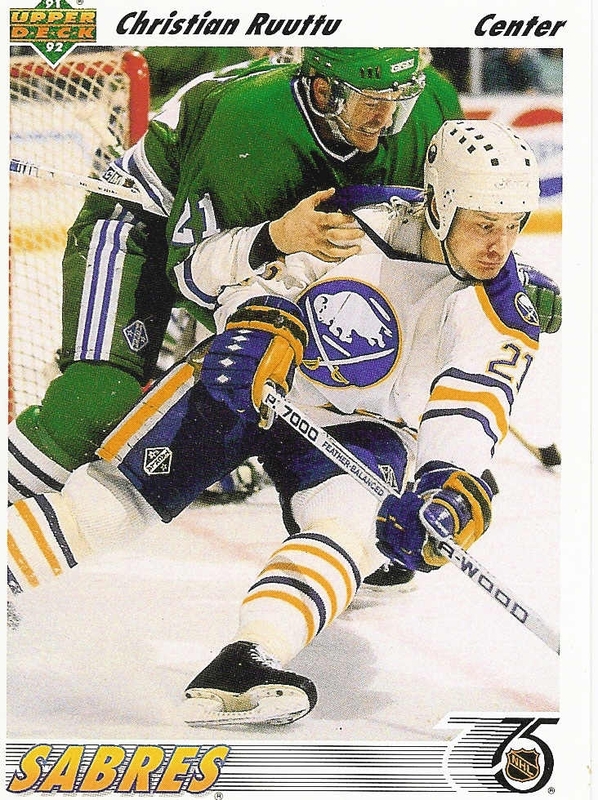 If we’re including Proset, it doesn’t get better than Kelly Hrudy’s Proset card. Hahaha thanks for the responses guys. Rob – That’s a scary close resemblance!